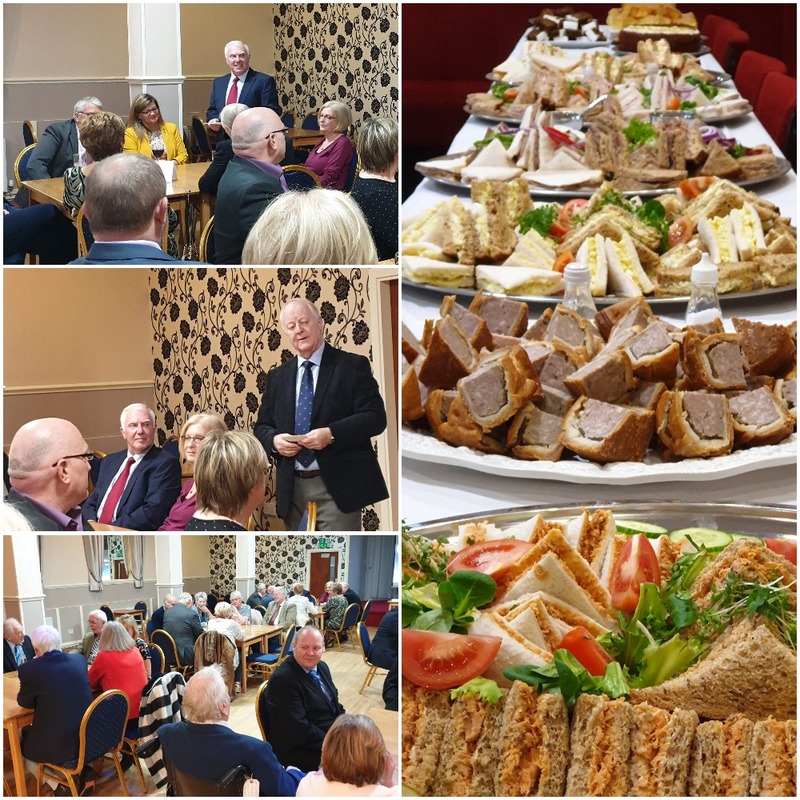 On Sunday the 14th April, around 50 Brethren, Companions and their guests, which included wives, partners and family, met at the Hawkshaw Suite at Darwen Masonic Hall, for the inaugural East Ribble District Honours Reception. This was to recognise those who have received first appointment, promotion or reappointment at Provincial Grand Lodge in November 2018, along with those who have received the same at Provincial Grand Chapter in March 2019. It was also to thank those from the District who work with it Chair one of the ELMC Committees, our three Fellowships or those who contribute towards District and Province events, such as setting up and assisting at the Provincial Grand Lodge and Chapters meetings. A prosecco or orange juice reception was a welcome beginning to what was to be a lovely afternoon. Once seated, the guests were officially welcomed by our District Chairman WBro Dave McGurty who immediately passed over to the Assistant Provincial Grand Master, WBro Alan Kirwillian who thanked everyone for their company. He went on to thank the Brethren for their work within the Lodges and Districts which had led to their respective honours, he also made reference to the partners who support the Brethren whilst enjoying temporary ownership of the remote control whilst they are out! WBro Kirwillian then handed over to the Assistant to the Provincial Grand Principals, EComp David Dunn, who reiterated WBro Kirwillian’s comments and thanked the Companions in particular for thie support of the Royal Arch. The guests were then treated to a sumptuous afternoon tea with lots of sandwiches, pies and cakes to keep everyone changing their mind about a Sunday Dinner later in the day. This was a successful new venture and a lovely celebration of what is a landmark in any Masonic Career. Article and images: East Ribble District Team.